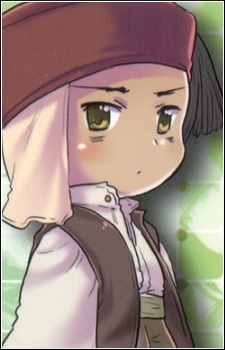 His older brother is Cyprus, who is a separate character in the Hetalia series (a common fan-misunderstanding). They seem to get along rather well, and in the Hetalia drama CD, they talk about unifying to make one country, but no answer was ever decided on. Currently, Northern Cyprus is trying to convince Cyprus to become friends with Turkey instead of Greece. Greece does not like Northern Cyprus despite his close friendship with Cyprus. He once said that he’d disown Cyprus if he didn’t cut off all ties with Northern Cyprus. He also appears to dislike Sealand, seeing him as a rival of some sort. He’s depicted as a small child, and cannot “grow up” because he is not recognized as an official country by anyone in the world besides Turkey. For this, he respects and looks up to Turkey, going so far as to dress like him. His personality is rather serious, and he appears to be stern and quiet. He speaks in a monotone voice, and is quite proud.